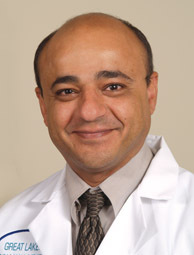 Dr. Emad Mikhail started Great Lakes Management in May 2006. Prior to starting his own practice and with over 20 years experience in practicing medicine, he worked at The Cleveland Clinic where he also did his Residency program in Anesthesia and Pain Management Fellowship training. Dr. Mikhail attended medical school at the University of Cairo in Egypt in 1984. He is Board Certified in Anesthesia and Pain Management.